Seek Social Support. Ask your coworkers if they have time to talk and tell them specifically what you need. Do you need to vent? If so, ask them to listen. Do you need their feedback? Then ask them what they think. These interactions can occur in short breaks or during lunch. Don’t assume that your coworkers are too busy. Ask them for support. Prioritize Tasks. If you’re stressed about everything you need to get done, try prioritizing. Create a list of everything you need to do and then identify which are the top priorities and which tasks can wait till the next workday. Every task may seem like a top priority but rarely is this the case. Ask yourself: Which tasks must be completed today? Which tasks can actually wait until tomorrow? Focus on top-priority tasks first before designating time to other tasks. If you are unsure which tasks should be your priorities, ask your employer for feedback. 1) Look around and identify five things that you see around you. 2) Listen and try to identify four sounds that you hear. 3) Using your hands, touch three items around you and notice how they feel. 4) Breathe in the air through your nose and identify two scents that you smell. If you cannot smell anything, put an object close to your nose to distinguish a scent. 5) Identify one taste. It can be a taste that is currently in your mouth or something you can place in your mouth, such as a mint or a drink. You can remember this exercise by recalling 5-4-3-2-1 (sight, sound, touch, smell, and taste). The more senses you use, the better the chance that you will achieve mindfulness. 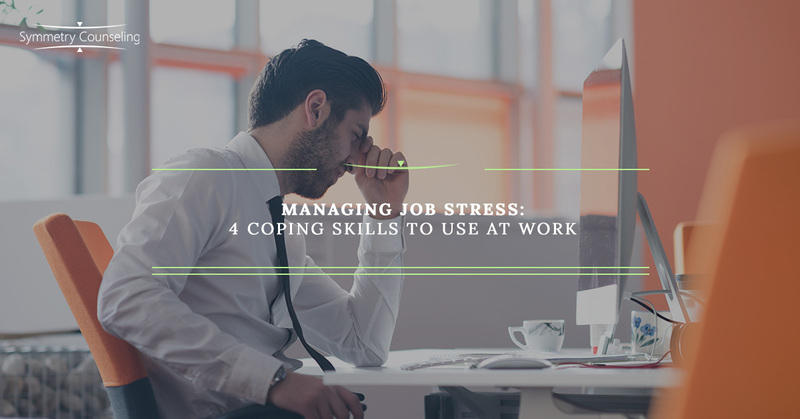 Relaxing at work can seem like a difficult task but it’s possible. Try these simple skills. If you need help to manage anxiety or work-related stress, contact Symmetry Counseling today by calling our office at (312) 578-9990.